Download an excerpt of the PDF (cover + overview) to get a feel for the pattern. 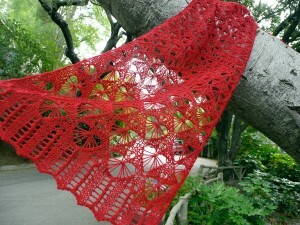 Fragile Heart is an airy scarf with lace pattern worked on both sides. The hearts are worked in one direction followed by a short lace edge, while the second edge is picked up from the initial provisional cast-on and worked in the opposite direction. The heart stitch requires attention. For questions or to report errors, please email me at dada @ fluffbuff.com or send me a message on Ravelry (my Raverly ID is “knitaly”).